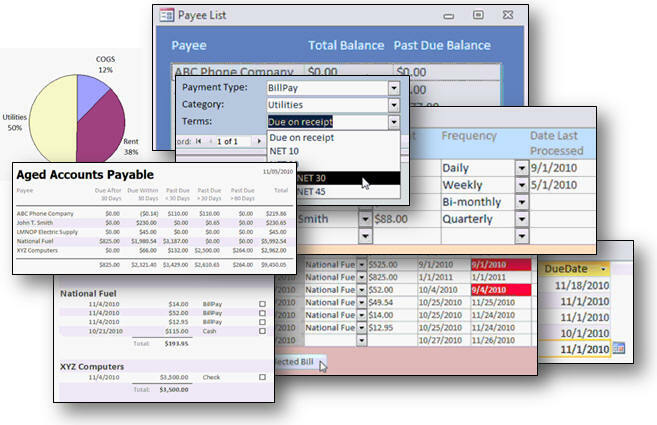 This 11 hour video seminar will teach you everything you need to build a database in Microsoft Access to manage your Accounts Payable and Bill Payments for your small business or personal finances. This seminar was developed because most of my other Access courses and seminars deal with managing the "in" part of your finances (invoicing your customers, tracking their payments, and so on). This seminars covers the "out" part of the equation. If you have ever wanted to keep track of your bills and accounts payable, but find other "canned" financial programs too limiting for your accounting needs, this seminar is for you. Here is the perfect opportunity to custom-tailor a database solution for your needs. Don't change your business to meet the needs of your software. Your software should adapt to your business methods. Click on any of these videos for more information on exactly what's covered in this seminar. The first video is an overview of the entire seminar. The second is a preview of the database we build in class. This will let you see all of the features we'll be developing - to make sure it will meet your needs. The last video is an in-depth lesson summary showing each lesson's topics. seminar so you can see everything that is included. Description: Learn how to build a database to manage the accounts payable and bill payments for your small business or personal finances. Includes a sample, customizable, working database, as built in class. We will begin by creating a form to track your payees. A payee is anyone to whom you send money, such as a vendor or service provider. You can assign each payee a default payment type (check, online BillPay, credit card, cash, and so on). You can also assign each payee a category (utilities, car payments, rent, etc.) and specify payment terms (NET10, due on receipt, etc.). You can also specify a priority for each payee - so you can pay the URGENT bills (like your mortgage) quickly. You will be able to view all of your payees at a glance. You will see the total amount you owe them, how much of that is past due, the date of their last bill, and the date of your last payment to them. You can sort on any of these columns. You can hide inactive payees (companies you no longer do business with, for example). You can add bills for each payee. Enter the amount, and the Bill Date defaults to today's date. The Due Date is automatically calculated based on your terms with that vendor. When you're done entering bills, you'll see a summary of all of the bills for each payee on their Payee screen, along with a total balance. You can sort by any column. Double-click on any one of the bills listed in the box above, and it opens up the Bill Detail form where you can see more information about this bill, such as the balance, any payments made, discounts taken, and so on. To pay this bill, just click on the Make Payment button. The database will ask how much of this bill you want to pay. Enter the amount and click OK. Your payment will then be noted on the Payment form. You can make multiple payments for one bill / invoice. In addition to entering bills, you can also use the Bill List form to get a quick look at what you owe. It will show the vendor, due dates, amount of the bill, and highlight something that's past due. There is also a Bill Summary form that displays all of this information in addition to the balance due and vendor priority. You can sort this list by any column. You can also filter the list to show bills that are due now, due in 7 days, past due, and so on. You can also decide to see paid or unpaid bills. Use the QuickPay Selected Bill feature to automatically enter in a full payment for the selected bill. You can do this to quickly go down the list of bills that are due and pay them all with one click. If the system notices you qualify for a discount on one of your bills, it will prompt you. You can choose whether or not to accept the discount. You can enter recurring bills that get automatically added to your list of bills to pay at regular intervals (weekly, monthly, quarterly, etc.). You'll see a warning message on the Main Menu if you have payments to process, or recurring bills that need to be added to the system. When it's time to sit down and process your payments, you can limit the list based on the payment method. For example, you can pick BillPay to show all of the items that you need to go onto your bank's web site to pay online. Click on View Payment Report to print out a report showing all of your payments broken down by vendor, date, and payment amount. When you're done processing your payments, click on the Mark Visible Payments as Processed button to indicate that you have sent out these payments. Optionally, you can click on the check boxes to mark/unmark these items as processed. You can use the database to print checks on your printer. Click on the Print Checks button. Any payments for the same vendor will be consolidated onto the same check. Yes, we'll even use a function to turn $18.97 into "Eighteen Dollars and Ninety Seven Cents." And, of course, there are several different reports you can generate. You can print an Aged Accounts Payable report showing how much is owed to each payee, how much is past due, and coming due in the next 30 days. You can generate a report showing total expenses between two dates. You can create a pie chart showing expenses by payee category between two dates. Again, this seminar is perfect for anyone who wants to learn how to build a Microsoft Access database to manage payables for a small business or your own personal finances. You will be able to track payees, vendors, bills, payments, and more when you're finished with this seminar. This seminar is very long - almost eleven (11) hours - but it's broken up into easily managed lessons of about 10 minutes each. You can sit down, watch a lesson, review the material, test the code out yourself, and experiment. Do a little bit each day. It's long, but it's comprehensive - you won't miss a single step as I've recorded everything from start to finish. All of the sample database files for this seminar are available on my Web site. They are available in Access 2007/2010 and 2000 formats (Access XP and 2003 users can download the 2000 version which is compatible). You can download the sample databases here. This seminar is available to view online in the Amicron Theater. You can click here to watch the first lesson absolutely free. What's past due? Past due 30 days? What's coming up in the next week, month? Richard on 11/10/2010: Microsoft Access Payables Seminar Build a database to manage the accounts payable and bill payments for your small business or personal finances. This seminar has several main goals. You will: 1. Track payees / vendors and all related data 2. View account balances at a glance 3. Enter invoices and bills, including recurring bills 4. Process payments for each bill, even multiple payments 5. Print checks right from the database 6. Assign payment terms to vendors, calculate discounts like 2%10 NET 30 7. Generate various reports, such as an aged accounts payable Click here for more information on this seminar. to any subroutine that generates this error message. Alex Hedley on 11/11/2010: Intellisense in Access, brilliant addition! Yep. This is a bug. Somehow the video components were added out of synch. I'm fixing it now. Thanks for bringing this to my attention. Julius Bratton on 11/12/2010: FYI, when i downloads this course. The order of the lessons in the ini file is incorrect 00 - 09 is at the bottom. I was able to fix it but other users may not be able to. See what happens when you forget the "ORDER BY" clause in your SQL statements? Videos download in the wrong order. :) Thank you for bringing this to my attention. It's fixed. You can re-download the lessons if you like and they should come in the right order this time. I'm surprised it's worked this long without any other courses having this problem. Brent on 11/14/2010: I don't know if I am the only one having this problem, but I download the videos and I watch with Windows Media Player, I don't want to have to install more players and they have been working, but when I got up to Lesson 5 It seems to freeze on one screen and the audio continues on. Brent, it's always possible that THAT specific video didn't download 100%. Try downloading it again and let me know. It's the EXACT same video file that appears in the Theater, which nobody else has complained about. Is anyone else having this issue? If you can give me the time index of where it freezes for you, I'll check it out myself. I just re-watched the first 5 minutes of the video, and it's OK for me. Again, try re-downloading it. Kenneth Lange on 11/16/2010: I am Trying to follow along and build your Accounts Payable Database to see how it works, but when I got to AP-23 Seminar at timestamp 5:54 the "PayeeListF" showed an "Add Payee Button" that I did not have on my form. In Seminar AP-24 @ timestamp 3:45, my recolor code is not working as yours does it the video. In Accounts Payable Seminar AP-25 @ timestamp 1:30, the code in the Video Seminar shows 'Dim S' & 'Dim C'. My code from going through the Seminar to this point shows 'Dim R' & 'Dim C'. Is there something that I did Incorrectly, or am I missing something? I am a Newbie with Access Programming. I'll have to go through and re-watch the videos to see exactly what you're talking about. Is anyone else having this problem? I do not know why, but the Video Seminars (Currently viewing Accounts Payable), playing for me in the Amicron Video Player seem to play audio, but the Video seems locked up when I try to play them sequencially. I have found that when the video is locked up, Pressing the 'Stop' Button, then wait for a few moments and then Press the 'Play' Button and everything seems to work Fine again. Yes, I also tried to install your updated video player. Iam using windows 7 with the latest updates from MS.
Kenneth, I don't know what the problem could be. You say it works fine in the online theater, but you have problems with the download version. I, too, have a PC here with Windows 7 and all of the latest updates (IE, WMP, etc.) and it works fine. Can you bypass MY video player software and play the video files directly from Windows Explorer? They should be in your Documents/599CD folder. As I have been following along with your Accounts Payable Seminar Series, I am in Video 45 on Referential Integrity at timestamp 7:37 and you are adding Forms!Payee!BillList.Requery to the Form_Close Event, but I already have that in the Form_Close() event from a Previous Lesson. Did I miss Something? That's always possible. :) It could also be that I added it, accidentally deleted it, and then re-added it again in the video. Most of the time while I was building this seminar, I had TWO copies of the database going. I would make the change in DB1 to make sure it worked, and then walk through it on video for DB2. It's always possible I goofed and added it twice. The important thing is that it works. Ha ha. Excel 2010 is coming up next. jackie on 11/21/2010: do you plan to make a handbook for this seminar? Yes. If enough people sign up for it, I will produce a handbook for it. Brent Rinehart on 11/28/2010: In this lesson around 10:50 you talk about changeing the default value of the sortby box to display the form by due date, how would you show due date desc, I tried typing d"uedate DESC" in the default section, but still showed due date with the oldest unpaid bill at the bottom I would like the next bill due to show on top. You can make it "DueDate DESC" if you want. That should work. However, keep in mind that the OLDEST dates are the SMALLEST values, so if you sort it that way you'll see the bills due furthest in the FUTURE first. Remember to put this as the value in our Sort Box - not the listbox itself. Brent Rinehart on 11/29/2010: After going through Lesson 19 - Bill Summary Form 5 when I double click on the billsummaryF I get a error that opos up that says "syntax error in FROM clause" I double checked everything I did could not find anything wrong even restarted with the backyp database before lesson 19 and redid it and got the same error. What would cause this? lynn robbins on 12/5/2010: Regarding deleting or changing data in an object: query, form.report. In which does this change or delete data in original table or throughout database? Lynn, I don't understand your question. Can you elaborate please? Lynn Robbins on 12/22/2010: In what objects is the data live. If I change data in a query or report will it change or update the original data. If i make an error entering the data or mistakingly edit it, Will it change the original data? In which objects do I have to be careful about this? Tables, queries, and forms are all LIVE. You can't change data in a report. If you make a mistake, you can usually undo it (with the newer versions of Access). Once you commit the record to the table, however, you could be out of luck. Of course, Rick's #1 Rule is ALWAYS, ALWAYS, ALWAYS make a good backup. Steve Henderson on 2/14/2011: I use Access 2007. When I try to set a Record Source on the All tab of the Property Sheet it asks which table I want to attach it to, but it does so inside a Query, not as you show. Is there a problem with my Access settings or is it another issue? Thanks. Steve, I'm not sure what the problem is. You should be able to put any table, query, or even an SQL statement in the Record Source property of a form. Can you tell me, more specifically, what you're doing and what is happening? You're adding a month and then subtracting a day. So if you have 9/1/11 it will add a month, bringing you to 10/1/11 and then subtract one day to 9/30/11. This gives you from the FIRST to the LAST day of the month. Kenneth Lange on 6/3/2011: Maybe I did something wrong here, but I thought the bills would have shown up in the Recurring Bills to show that I havePayments Due. 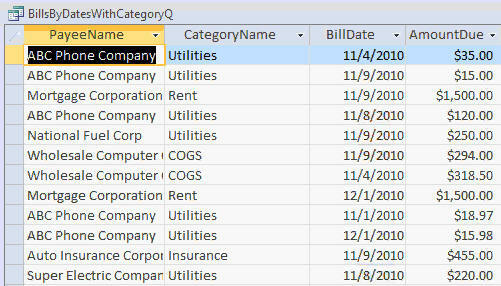 After looking at the code in my program, I see where the Recurring Bills are Seperate from the Stand Bills in my Database. Is this the way Your BillsT and RecurringT work? Leroy A Diaz on 10/4/2011: i have Bought Your Access Payables And Have Tried To Build It As You Go BUT I Have Come To A Wall On It. When You Build The "PaymentsForCurrencyBillQ" And In The Criteria Section Put "Forms!BillF!BillID" it works fine when you run it. The problem i am having is when you add a listBox to the "BillF" and use the wizard to build it. I am using access 2000 and the wizard for this part gives me an error, saying "No Value Is Given for one or more parameters" so is there a way to do this for us who still use access 2000? Jim Gray on 11/22/2011: I am building a database for our volunteer ambulance service. We need to submit an annual budget to the city and I would like to use this seminar to keep track of our payments for services, medical supplies, etc. Would I use the vendor categories to tie payments to specific payables accounts assigned by the city and then put these payments into our budget for the year? We need to keep track of how we stand against our submitted budget, submitting these status reports to the city council on a monthly basis. One more little wrinkle..Each invoice could be spit into several accounts so I need to allocated partial payments via line items on the invoice. It looks to me that this seminar would accomplish all these goals and more.... Thanks as always Richard for your insight. Jim Gray on 2/16/2012: How exactly would you handle a payee that could have invoices in several different categories? (eg. a VISA business account) Would you set up that as a many to many relationship with a cross reference table? If so would that influece how you set up the remainder of the tables and forms? Thanks as always for your advice..
Jim Gray on 2/20/2012: Couldn't you make the RecolorLabels Sub from before a public function and just pass the label names to it, rather than rewriting this code here? Not sure but I think that you forgot to add the last statement to your RecolorLabels sub---the Me.Controls(LabelName).Forecolor=rgb(200,100,50) statement? Jim Gray on 2/28/2012: I too have that error message pop up. I have researched the syntax error problem on your forum and found nothing applicable and I will go back like Brent did to find where I made an error. I was just curious if you folks had a chance to research this issue and had any results. Thanks for your continued time and patience with us who struggle a little with some of the intricacies of Access. SteveHenderson on 10/2/2012: On lesson 19 of the Access Payables seminar I added the total for the Balance column (time index 4:33). I now receive an error stating 'Syntax error in FROM clause' whenever I run BillSummaryF. I've checked my code against that in the lesson and can find no difference in spelling, spacing, etc. It looks the same. What can be causing this error? Thanks. and LastName isn't IN the CustomerT, you'll get an error. SteveHenderson on 10/2/2012: The problem seems to have corrected itself when I continued with the lesson and applied the 'size to grid' formatting. Why would sizing eliminate the error? Thanks. Who knows? Gremlins. :) Seriously... sometimes problems just fix themselves. When something CRAZY is going on: (1) close and reopen the form, (2) close and reopen the database, (3) reboot the computer. Sometimes code just needs to reset, or variables need to clear, or memory needs to wipe, or SOMETHING is going on behind the scenes that messes stuff up. Bruce Reynolds on 12/7/2012: In the join property between BillID of the BillT table and BillID of the PaymentsByBillQ query, is this a one-to-one relationship? If not, is it a special join? Also, is this a local as opposed to a global join? PaymentsByBillQ only has one table in it: PaymentT. There are no joins. The BillID comes straight from the PaymentT. Is the default data type for the inputbox a variant data type? Bad habit. You don't HAVE to DIM all your variables, but you should. Yes, if you don't DIM them, you end up with a variant, but VB is pretty good at realizing what kind of data you're working with. It's not like C/C++ where you have to DIM everything. That's what that "option explicit" statement does. Bruce Reynolds on 2/4/2013: This was the most comprehensive Access Seminar that I have taken on 599cd.com. I am using Access 2007 version, when I create a form it's coming full screen/page and not as I see in video a smaller type of form, I have tried searching over internet for a solution and cant find one, please guide me. I cover this in my Access Beginner Level 2 class. You have to switch your database from the new TABBED VIEW to OVERLAPPING WINDOWS. It's under FILE (the round Office Button in 2007) then Access Options > Current Database. Please guide me in setting up currency to Indian Rupees ( Rs ) instead of $ for entire project. This is something that you do in your WINDOWS Control Panel under Regional Settings. It's not something that you set up in Access. khaja nizamuddin on 7/28/2013: Hi Richard..
You have mentioned in Intro lesson that there is a lesson for receivables , I wish to know if there is a seminar similar to payable for receivables. There isn't a specific seminar for this topic because I covered it in my Access (2003) Advanced series in lessons 305, 310, and 312. CLICK HERE for links. I will also be covering this topic again in my upcoming Access 2013 lessons as I'm currently in the process of revising them and rebuilding the order-entry system. Up to this point it all worked out fine. However when I reopen the Bill Summary Form, it is blank. The Due Today and Unpaid Bills ONLY are the defaults like yours, but there is no payee information. My Total and Past Due columns sort beautifully. However my last bill and last payment sorting doesn't work. I have checked the SQL statements to make sure they were right, but I don't know what I did wrong / missed! Ramona Woitas on 9/7/2013: Richard I am so sorry! I guess a good nights sleep does wonders. I must have been going cross eyed last night. When I go to open the payee list from the main menu and select National Fuel, I get a Run-Time error '2447': This is an invalid use of the . (dot) or !operator or invalid parenthesis. I need to see your WhereStr and SortBy to tell you what's wrong. MsgBox the complete SELECT statement (set it to a variable first then MsgBox it) and that should show you where the problem is. Ramona Woitas on 11/5/2013: I'm just reviewing the payables seminar again as there is some very good information in it that I can use for my database. However I have one question! You were creating the "BillsWithPaymentsQ" and you brought in the PayeeID Field. 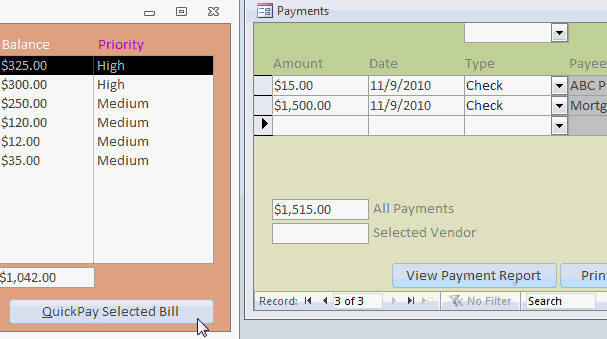 Is there a way to see the actual Bill Name and Payee Name in the query instead of the Bill ID and Payee ID number? Just add the 'PayeeT' to the Query, join on the [PayeeI] and pull in the [PayeeName]. Thank you. I'm still in the process of moving the video files to a new server. That's one of the pages I haven't gotten to yet. I'll get it fixed soon. You can find the seminar in the Online Theater and the first lesson (Introduction) for ALL of my courses is unlocked. Your ORDER BY clause is probably typed in wrong. What do you have? Post it here. Hi Richard, Just wondering, if I have a bunch of bills in the paymentunprocessedlistF, and I go to quickPay a selected bill, the form only shows me on a new blank form, and I have to manually scroll up to see the quick payment just made. Is there a way to restrict the visible records on this form? Hope you know what I mean. Hi Lynda, I'm not exactly sure what you mean so you might need to explain a little more but normally if you want to restrict a set of records you can just create a QUERY with the ones you want to show and use that as your Record Source. Standard terms of trade here in New Zealand are for a specific date, e.g 20th month following - could you please tell me how I could enter those sorts of terms so they will automatically update the duedate field. So you want the 20th day of each month instead of the first? That's easy. Find the first day and then add 19 to it. Can you explain how to format currency or number like 235,4575.23 and Align to right. All list box in Access payable Seminar lesson. If I use CCur(FiledName) It formatted with $ sign I cannot use $ sign for local currency for Rupees. I have set all currency Field, Data Type Number, Field Size Double, Format Standers, Decimal Places 2 . I tried VB Code Amount Due like this Format( AmountDue , ###,###.00) But it Did not come right. Can you please explain how to format Numbers and Date also like dd-mmm-yy to right Align. What is 'Region and Language' set in Control Panel? You can set the alignment of a Field in the Ribbon. Select your Textbox, go to the Form Design Tools | Format and select the Align Right option. Thank you Reply for my Email. But I could not get the answer I need Align Right & Format Numbers in List Box Not a Text Box. Ah sorry I missed the Listbox, this has far less control, if you want a particular FORMAT in the Listbox add the Format to the Query then base the Listbox source on that Query. Unfortunately you can't align the text in a Listbox. You could make it a mono-space font and use some padding (extra spaces) to mimic an align right. Lynda Chase on 7/17/2015: Hi Richard - At 12.49 I would like to be able to set the default value to the 20th of the month following, which is standard terms of trade in New Zealand. Can you please tell me how I would write that in the Default Value Field. Mark on 5/6/2016: I'm having problems with my DoCmd.GoToRecord,,acNewRec - it opens the form, but does not go to the new record and populate the fields with the data. Try doing one thing at a time. Yes, try the second as well. Until you find the one that doesn't. Is it possible to format my "Paid" field in a list box to show green and my "Unpaid" field to red, like you can in a continuous form? List boxes unfortunately don't have this capability. Matthew Pattison on 12/7/2016: 8.55 or can u lock billDate with a AfterUpdate event? to prevent changing it? Do you want it locked after you set it? You could toggle the .Enabled or .Locked Properties in the AfterUpdate. John Hubbard on 9/6/2017: In lesson 13 04:40 ref payeelist sorting label code - getting compile error sub or function not defined when clicking on payee label. The RequeryPayeeList is highlighted. Thanks in advance.. Does that exist on the form? Did you rename the List? Darrell Babers on 3/28/2018: "Automation error Library not registered" When I try to use the chart Wizard any suggestions? Have you recently updated Office or installed other programs? Usual reboot, repair, re-install. Check the instructions and be sure you want to do that.